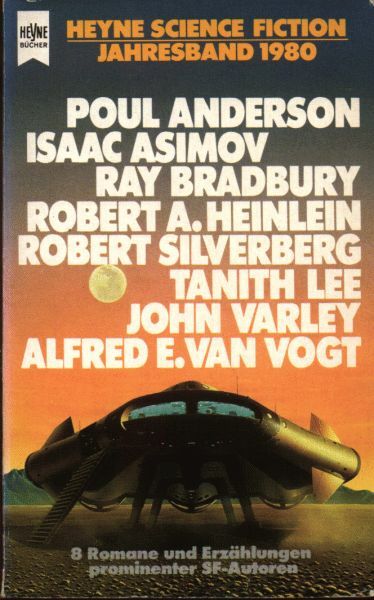 Notes: The cover image is the one from the 1979 NEL edition of Robert A. Heinlein's 'The Man Who Sold the Moon'. Poul Anderson's nt translated by Birgit Reß-Bohusch; Asimov's ss translated (1962) by Charlotte Winheller; Bradbury's ss translated by Birgit Reß-Bohusch; Heinlein's novella translated (1971) by Fritz Steinberg; Silverberg's ss translated by René Mahlow; Tanith Lee's novella translated by Birgit Reß-Bohusch; John Varley's nt translated by Rose Aichele; van Vogt's novel translated (1963) by Walter Ernsting (aka Clark Darltion). All author introductions are with a bibliography of their books with Heyne and a photograph.